Correction: A previous version of this article incorrectly stated the Fox News had not shown the Charlie Hebdo cartoons. 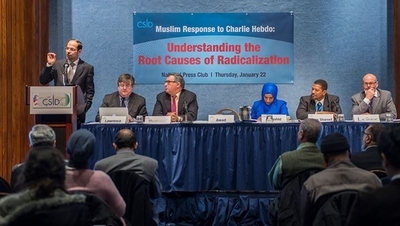 A panel discussion Thursday hosted by the Center for the Study of Islam and Democracy (CSID) promised to plumb the "the root causes of radicalization" in the wake of the Paris terrorist attacks at Charlie Hebdo magazine and a kosher market. It turns out the problem is not Islamic theology or radical Muslim ideology. It's all the things the West does wrong. Fix those problems, panelists said, and things get better. During the 90-minute program at the National Press Club, no speaker discussed the Quranic verses invoked by terrorists in the Islamic State or al-Qaida to justify their actions. Instead, speakers emphasized a host of grievances that they say lead young Muslims to believe that peace and democracy will not lead to the changes they desire. Muslim immigrants must be treated with more dignity and equality, said CSID founder Radwan Masmoudi. "Basically you must end all forms of racism, discrimination and hatred directed against Europeans of Arab descent or of the Islamic faith." The West also must end the war in Syria and denounce the ouster of the Muslim Brotherhood regime by Egypt's military in July 2013. Dalia Mogahed, a pollster and former White House adviser, took issue with the public reaction to the attacks. Defending the right to offend people as part of free expression plays into the terrorists' agenda, she said. There is such a right, but society normally polices "incredibly offensive depiction(s)" of minorities. She wasn't offended by the Charlie Hebdo cartoons as a Muslim, but she was "disgusted" by them as an American. "The correct question isn't, 'can we?'" she said, "the correct question is 'should we?'" This ignores the magazine's history of satirizing all faiths, generating no violence from Christians or Jews. Last week, 10 people were killed in Niger when protesters angry at the latest Charlie Hebdo cover torched churches. Mogahed called the attack on Charlie Hebdo "a very strange event" because it came at a time in which there were no protests. "The shooting literally came out of nowhere. It was a calculated act of provocation on the part of terrorist organizations. This was not an organic, or even fanatical, response of just rage and anger against cartoons." The assertion is puzzling because, as a pollster, Mogahed has monitored attitudes in the Muslim world for years. As such, she is well aware that the Paris attacks did not happen in a vacuum. In 2004, Dutch filmmaker Theo van Gogh was murdered on an Amsterdam street by a radical Muslim angered by van Gogh's film, Submission, which focused on Islam's treatment of women. In 2010, Danish cartoonist Kurt Westergaard survived a home invasion attack by an ax-wielding Somali with ties to the Islamist terrorist group Al-Shabaab. American Colleen LaRose, known as "Jihad Jane," is serving a 10-year prison sentence in part due to her plotting to travel to Sweden to kill another cartoonist, Lars Vilks. That murder, she wrote in an email obtained by federal investigators, would be "my goal till i achieve it or die trying." There are numerous other examples of plots and attacks targeting people for their depictions of Islam's prophet. But the intent behind the attacks, Mogahed said, "was for Europe to respond essentially exactly as it did – to assert the right to offend by reprinting the cartoons." That certainly is a point of view. Another is that the terrorists hoped to intimidate others from showing images of Muhammad under any circumstance. Given that major American news outlets, including the New York Times, CNN and others have refused to show the Charlie Hebdo images, the attacks succeeded. The focus on radical Islam and defense of free speech that resulted from the Paris attacks gave the terrorists "the rhetorical victory they desired," she said. A better response would have been "to reassert the place of French citizens of Muslim faith in the republic." Mogahed and others repeatedly expressed resentment that the terrorists' beliefs were being conflated with the beliefs held by 1.7 billion Muslims worldwide. They provided no examples to show this is what people mean when they talk about Islamic extremism. Whatever the merits of Mogahed's argument, it seems to have little connection to the causes of radicalization, which is what the panel was supposed to discuss. In a podcast Wednesday, atheist writer Sam Harris slammed an emphasis on the West's flaws in analyzing the Paris terrorist attacks as "completely insane." After slaughtering the Charlie Hebdo staffers, Harris notes, Cherif and Said Kouachi yelled, "We have avenged the prophet." They did not lament racism, disenfranchisement or any other grievance. "That's what causes someone to grab an AK 47 and murder 12 cartoonists and then scream 'Allahu Akhbar' in the streets," Harris said facetiously. "It is a completely insane analysis. Even if you grant everything that's wrong with capitalism and the history of colonialism, you should not be able to deny that these religious maniacs are motivated by concerns about blasphemy and the depiction of the prophet Muhammad, and consider their behavior entirely ethical in light of specific religious doctrines. And it's a kind of masochism and moral cowardice and lack of intelligence, frankly, at this point, that is allowing people to deny this fact." 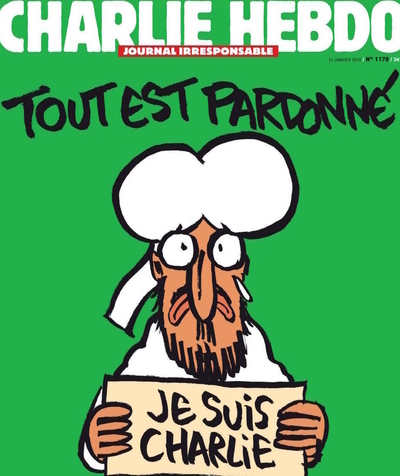 Harris argued that the Charlie Hebdo cartoons were not racist. But even if they were, emphasizing the offensive nature of the images shows someone "has completely lost the plot here." "[P]rotecting this speech becomes important when you have one group of people – 'radical Muslims' – who are responding to this offense with credible threats of murder in every country on earth. We can't give in to this." "People have been murdered over cartoons," he added. "End of moral analysis." Not for Nihad Awad, co-founder and executive director of the Council on American-Islamic Relations (CAIR). His prepared remarks at the radicalization forum focused on the frustration he said Muslim American youth feel for constantly having to condemn the actions of others and for drawing disproportionate law enforcement attention. "Islam has been blamed for the recent events, not the terrorists themselves," Awad said. The media's focus on the religious motivation inspiring terrorists and references to a war of ideas within Islam "is very offensive to me, to implicate the entire Islamic faith and the 1.7 billion people into accusing them of being inherently violent and warring among themselves. I believe this is dishonest discourse." Awad's assertion is contradicted by other Muslims who believe the only way to stem radicalization is by modernizing and reforming Islam, steering away from strict, literalist interpretations. In addition, those most offended by cartoons or commentaries need to learn more peaceful ways to express their frustration. Writing in the Wall Street Journal Jan. 11, Muslim reformist Maajid Nawaz called for "an open discussion about interpretations of blasphemy codes within Islam. Islam is an idea: Like all other ideas, it is open to scrutiny and satire. This is how we progress." "...We must oppose the notion that Islam, or any narrow interpretation of the faith, is above criticism. If we learn to challenge the ideology of those who have hijacked our faith, we will build the resilience that will allow us to prosper in a modern society. Furthermore, to accuse this view of being Islamophobic takes advantage of those in Western society who are desperate not to be considered offensive. It allows extremists to prosper without the checks and balances of critical thinking, returning us to the Dark Ages." Both Awad and Mogahed cited the example of Anders Breivik, the Norwegian mass murderer who killed 77 people in a bombing and shooting attack in 2011, as an example of the public's double standard. Breivik's manifesto made clear he acted out of a concern about the spread of Islam and multi-culturalism, declaring he is "a supporter of a monocultural Christian Europe." Christian leaders weren't put on the spot with demands to condemn Breivik's slaughter, Awad and Mogahed said. Instead, he was dismissed as a lone kook. In making the argument, the two failed to mention the Kouachi brothers' apparent connections to al-Qaida in the Arabian Peninsula, or the video by Amedy Coulibaly, who attacked a kosher supermarket shortly after the Charlie Hebdo attack killing a policewoman and four Jews, in which he expressed allegiance to the Islamic State. The Paris attacks and the slaughter being carried out by the Islamic State in Iraq and Syria have nothing to do with Islam, the panelists agreed. Mogahed did say young Muslims "need better religious literacy" to counteract extremist messages they may see on the Internet. But Awad ended the program with a defense of the word jihad. It's wrong, he said, to use it to describe terrorists acting in the name of Islam. It is a legitimate concept in the faith and should not apply to wars of aggression. "So to label terrorists as jihadists is no less than doing the public relations work for them. And the media unwittingly, or unintentionally, they have been helping ISIS. Politicians, when they refer to these people as jihadists, they are helping recruit people to ISIS." If Islam is a religion that stands for justice and peaceful coexistence, then the quest for an Islamic state cannot be justified as sanctioned by a just and merciful Creator. Neither jihadism nor Islamism permit the equality of all humans irrespective of their race or religion and should therefore be rejected. Our denial and our relative silence must stop! It is the duty of us Muslims to actively and vigorously affirm and promote universal human rights, including gender equality and freedom of conscience. "Believers! Conduct yourselves with justice, bearing true witness before God, even if it be against yourselves, your parents, or your kin." We must engage in and promote reforms where necessary, including an honest and critical reinterpretation of scripture and shariah law used by Islamists to justify violence and oppression. We must also recognize and loudly proclaim that the quest for any and all "Islamic State(s)" has no place in modern times. Theocracy, particularly, Islamism, is a proven failure. The path to justice and reform is through liberty. Nothing close to this sentiment was expressed at Thursday's CSID forum. Masmoudi, the center's director, instead said the debate needs to focus on the line between free expression and offending religion. "Every freedom must be respected, but every freedom also has limits," he said. "You don't have the right to transgress on others. That's why we need laws. Laws are to put clear limits on where your freedom ends and where the freedom of other people begins. In terms of freedom of speech I think we are all in favor. But there is a big debate on whether that includes the right to insult others, or the right to insult other religions in particular." Just the message to quell radicals, isn't it? Political correctness is incorrect; parity between two diametrically opposed belief systems is an oxymoron. It is a zero sum game. They can't get what they want unless we give up what we have. Free speech doesn't need qualifications from a belief system that doesn't provide the liberal democracy version for all of its citizens. As I read the passages utilized to stress the need to reform Islam based on the Qu'ran, I have to wonder if the selected passages were taken from the book of Mecca or the book of Medina. As we all know, if taken from the book of Mecca then the selected passages were likely abrogated in the book of Medina. I never cease to be amazed at the way in which those of the Islamic faith are capable of choosing passages that for their argument. Mohhamed preached deceit as a tool to defeat the "infidel" and it's one that has been mastered by Muslims across the globe. These people do not want to integrate into western society they want us to make exceptions for them and adapt to their belief system. The goal of all muslims is to have everyone living under sharia law and subservient to their ideology. One must study the quran and the sunnah intently and understand that the suras of the quran are not in chronological order, that only the suras documented after Muhammad left mecca are in play today, and that the suras applicable for modern islam leave no room for any other belief system but Islamic law, and that jihad must be waged by all muslims until their totalitarian system rules the world. No muslim leaders are going to stand up and march against the "extremists" because that would mean going against the quran and that's a death sentence! They have no intention of living under democracy. Their intention is to conquer the west from within, thus these demands that we make exemptions for them which is a first step towards that goal! One must understand the islam is not a religion, it is an expansionary, military-political ideology who's goal is totalitarian rule under sharia law wherever muslims live! Period! We must not be fooled and we must stand firm in our resolve to remain free and to live a life of liberty for all. douglas saying it as it is! Brilliant as always!